I’ve never been one to have an extensive skincare routine because I’m really all about the basics that make me look and feel my best. For the last 6 years or so I’ve slowly been transitioning to natural skincare products. Why? Well, I’m fearful of putting chemicals all over my body for years on end because there’s bound to be some major health implications that could catch up with me. Am I right?! Why not make the change while I’m still young! I’m not a scientist, doctor, or skincare expert, but I do know that our skin is the largest organ in our body. What goes on our skin makes its way into the bloodstream. With this in mind, my daily priority is to use all-natural products because of the toxins out there which can lead to health issues like allergies, sensitivities, cancers, hormone imbalances and infertility. 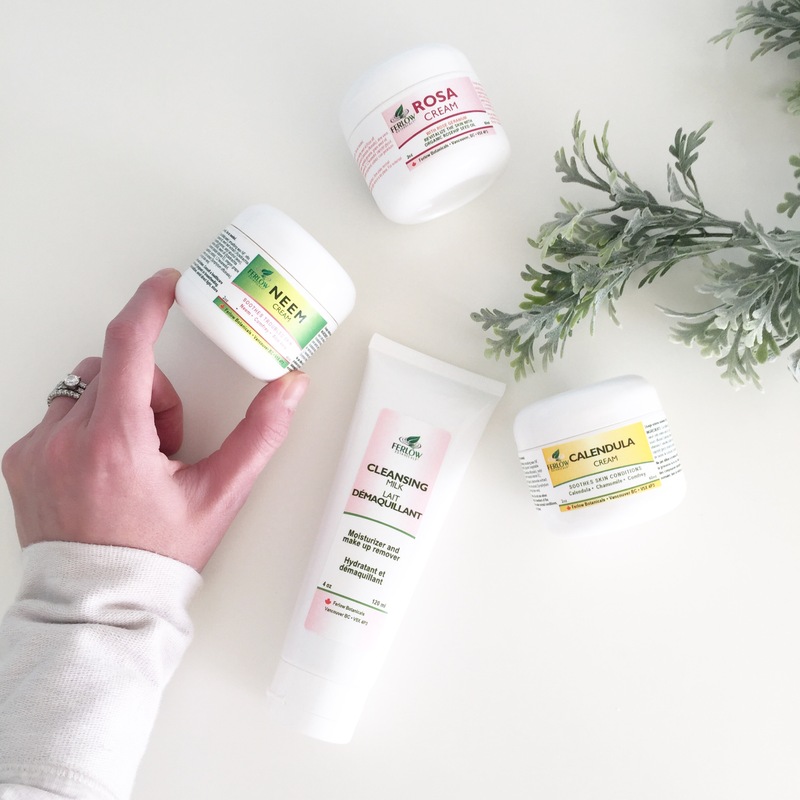 These days I find myself learning more and more about great natural skincare brands that don’t require me to compromise my health in order to get the results I want for my skin. 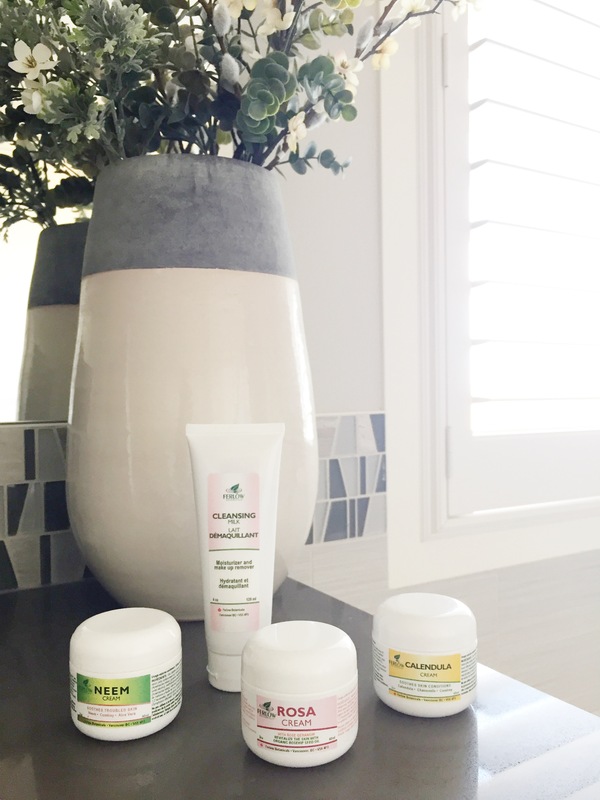 Today I’m sharing my new favourite go-to products from a great company out of Vancouver, BC – Ferlow Botanicals. Calendula Cream – I call this our ‘family favourite’. Someone in the house either has a scratch, minor rash or little bite and adding a dollop of calendula cream to the affected area works wonders. If you have a baby or toddler it also heals diaper rash or any little irritation they might have. Cleansing Milk – Every evening before climbing into bed I use this product to take off my makeup. I wear makeup almost every day so what I love about the Cleansing Milk is that it moisturizes my skin at the same time. Wearing makeup and washing it off can be very drying so this product is the perfect treatment to my eye area. 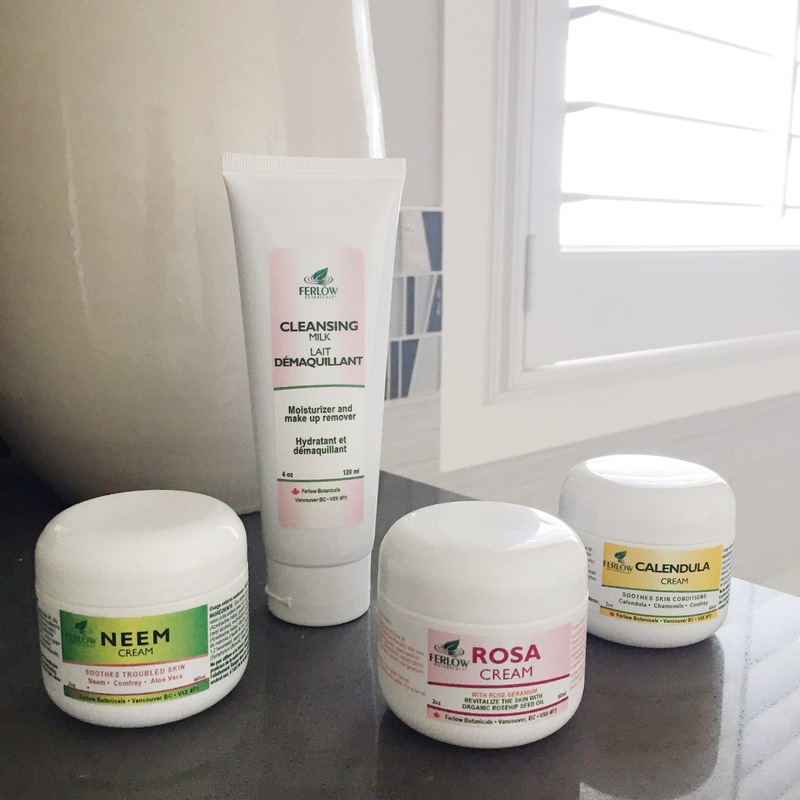 Neem Cream – Neem cream is awesome for sensitive skin, minor wounds or those who suffer from eczema breakouts. It’s definitely the best choice for those with extremely sensitive skin. Rosa Cream – This is my all-time favourite daily moisturizer that I use every morning and night!!! It’s very hydrating and perfect for our dry, cool climate in YYC. It also has a calming scent from the rose geranium essential oil (unscented) ingredient that’s used. I don’t wear perfume at all so having a hint of a scent on your skin that’s totally natural is a nice change. 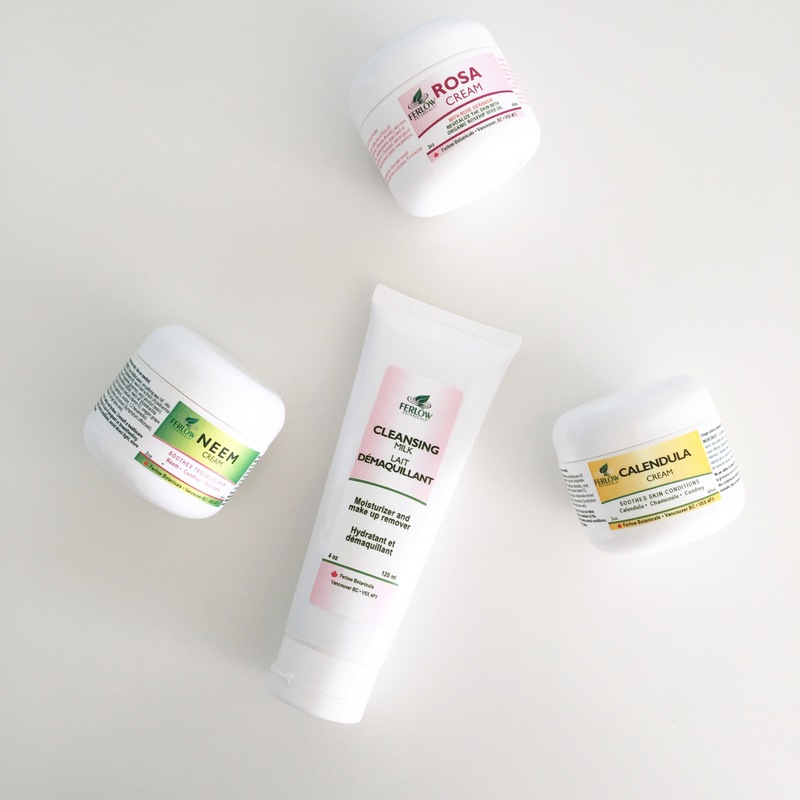 Overall, what I love about Ferlow Botanicals’ skincare line is that all of the products I’ve talked about are dense which means a little goes a LONG way. None of these products are harsh on your skin; everything is very hydrating and absorbs nicely. All ingredients are plant based without fillers, additives or toxins. Finding quality natural products can be hard and also expensive. If you’re thinking about making the switch just start small. If you can’t pronounce the ingredients, it’s probably not good – don’t buy it. Stay away from parabens and phthalates. Parabens are considered xenoestrogens and have been linked to reproductive issues and breast cancer. Phthalates are used in cosmetics to make them more flexible, softer, and last longer. It’s taken me years to figure out what products work for me and what products do not so I hope you find this post helpful and don’t have to go through major trial and error that I’ve dealt with over the years! Check out Ferlow Botanicals here to see what other great products they offer! Great post! I’m going to check the ingredients in my moisturizer right now! !